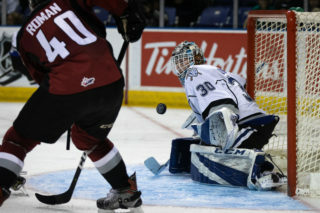 Victoria’s Steven Hodges notches two assists in 3-1 victory over Red Deer. 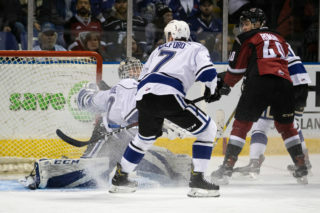 Victoria, BC – In a Saturday night match-up at Save-on-Foods Memorial Centre, the Victoria Royals welcomed back the Red Deer Rebels for the conclusion of a two-game set. 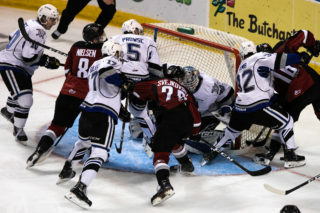 The Royals gave Patrik Polivka the start in net, while the Rebels countered with Patrik Bartosak. Austin Carroll opened the scoring on the powerplay at the 8:38 mark of the first period. Steven Hodges found Carroll in the high slot where the Royals’ forward snapped a shot past the blocker of Bartosak to give Victoria a 1-0 lead. Logan Nelson made it a two-goal game with another powerplay goal at the 12:51 mark. The Royals’ forward one-timed a Brett Cote pass from left point to beat a screened Bartosak and Victoria kept the 2-0 advantage after 20 minutes of play. Early in the second period, tempers began to flare as the physical play and scrums after whistles began to pick up. Tyler Soy increased Victoria’s lead after the club killed off a pair of penalties. With 5:35 left, Chaz Reddekopp’s shot from the point was stopped, but Soy found the loose puck in front and buried it past a sprawling Bartosak. With one minute remaining in the second, Cole Chorney notched a powerplay marker to pull Red Deer to within two goals. Carroll then squared off with Devan Fafard to complete the Gordie Howe hat trick and the Royals led 3-1 as the teams headed into the second intermission. The Rebels pressed to cut into the lead early in the third frame, but Polivka came up with multiple key saves to keep the Royals up 3-1. 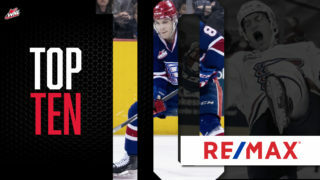 The game reached a boiling point with 5:34 remaining as Reddekopp laid a big hit then dropped the gloves with Wyatt Johnson as he won his first career WHL fight. With 1:22 remaining, Red Deer pulled Bartosak for an extra attacker and called a timeout, but Polivka stood tall to preserve the win. Royals 3 Rebels 1. Victoria went 2/7=28.6% on the powerplay, while Red Deer went 1/7=14.3%. The Royals outshot the Rebels 35-28. 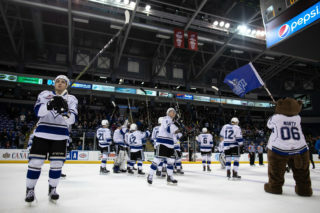 The Royals will now look ahead to hosting the Edmonton Oil Kings on Wednesday night. 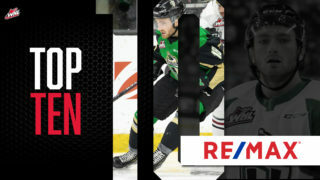 As announced during Saturday’s game, all fans who present their ticket stub from the November 2nd game against Red Deer at the Select Your Tickets box office will receive a $5.00 ticket to the game on Wednesday! This ticket offer is valid in the same section as the previous ticket. Some restrictions apply to luxury suite and rail seats in the Lion’s Den Restaurant. Puck drop is set for 7:05 p.m. at Save-On-Foods Memorial Centre.